There is still some time to learn how to use Poll Everywhere this semester! 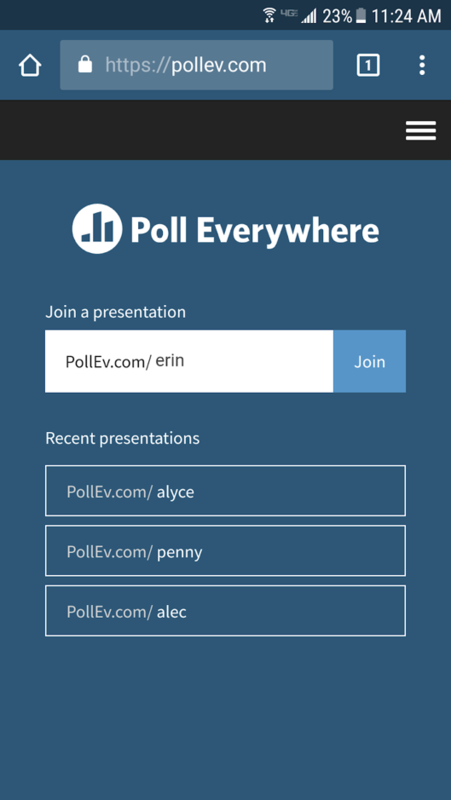 Poll Everywhere allows students to submit answers on the Poll Everywhere website, the mobile app, or even through text messages to close or open-ended polls that you create. In the video below, Assistant Professor of Political Science Eric Loepp discusses how he used Poll Everywhere in his course. If you are interested in learning more, register for the LTC’s workshop at noon on Thursday, Novermber 15th! Looking for some competition? This month Poll Everywhere released a new “Competitions” feature that allows you to create questions for a trivia-like activity. Students can compete live in class to earn points based on getting correct answers, as well as how quickly they answer. The feature includes a Leaderboard that updates with each round. short Webinar that introduces and explains the feature. If you need any help setting up Poll Everywhere, please feel free to contact the Learning Technology Center. Last week I looked at a couple of communication tips. This week I want to focus on another specific tool that is available for use like a clicker for student engagement: Poll Everywhere. I also want to share the story of how one of our instructors Lori Trimble, from the social work department has used Poll Everywhere in her class! Finally, there are a couple of training opportunities if you are interested in learning more about Poll Everywhere to see how you could adapt it for your own use. Poll Everywhere is an interactive tool adopted for use on the UW-Whitewater campus. 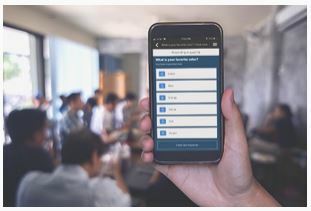 It allows you to create poll questions and prompts, which students can respond to in “real-time” through mobile apps, text messages, or the Poll Everywhere website. You can then display the responses live to the class, and incorporate what you find out into class discussions and group activities. One way to use Poll Everywhere would be to use an open-ended question to kick off a group discussion with a colorful word cloud. Another way is collect live, anonymous results by an audience who can participate via a website or mobile device. Responses can appear live, in real-time, directly in PowerPoint presentations. The most recent update has introduced live competitions! Have you ever encountered interactive pub trivia or other trivia contests with live leaderboards? Now you can build that into your class with your content using Poll Everywhere. One of the great things about it is that you engage your classroom without any clunky and easy-to-forget hardware. You can use a device most people have at all times — a mobile phone. You can also ask students to use their phones, tablets, or laptops to respond to polls that you present. The results appear live on the display. You can use this tool to quiz your class, discuss the results, and use that insight to guide the classroom discussions. I took some time to interview Lori Trimble of the Social Work Department. Lori joined the Social Work department as the Academic Department Associate (ADA) in January 2017. I asked Lori what challenges she was facing in the classroom and what she was using to solve them. One of the tools she talked about was Webex Teams – but the other one was Poll Everywhere. Lori: I was teaching New Student Seminar, with brand new freshmen. I broke them into small groups and that created lively conversations and discussions…but as soon as I combined a conversation to a full class: “CRICKETS!” There had to be a better way to keep the conversations flowing. Ted: What did you try? What did you do to get additional engagement? Lori: I started using Poll Everywhere. Specifically, using open-ended questions to encourage engagement. Since the lesson was on engagement, this seemed a good way to get ideas flowing. Ted: How did it work? Did you incentivize it at all? Lori: It worked great! While I was a bit nervous that with an open-ended question, I might get a smart aleck response, people started providing answers to the questions right away. It was clear once one student shared an idea others reacted similarly. It was a great way to get engagement; specifically some people not brave enough to raise their hand, this gives students a great way to participate without fear because their answers appear anonymously on the screen. After class – I was able to generate a user report because I limited my polls to registered users. I wanted to award participation points to students for joining in the conversation. This provided a way to get students involved, and I was able to record their activity. Ted: Why do you think this was a valuable tool to use? How effective was it? Lori: It was VERY easy for students to use, and the platform for creating polls is very user friendly. I asked them to bring a phone or laptop, and they did. I wanted to get students engaged – Poll Everywhere helped prompt the discussion; I facilitated it. Students were very excited to use the discussions in this way. Ted: Did you encounter any challenges or barriers to using it? Lori: There were a couple of hiccups. I did not realize being logged in for the first question didn’t necessarily mean I was logged in for subsequent questions. Texting responses did not work as smoothly as I hoped with registered users – but overall it was very intuitive. I want to thank Lori for sharing some of her experiences using Poll Everywhere in the classroom! If you are interested in exploring more about how to get started using Poll Everywhere there are a couple of upcoming information sessions. The sign-up links are below in resources (please note you will need to log in with your UWW credentials to register). Next week we return to the 2018 Horizon Report and look at the Challenges facing technology and higher education. Poll Everywhere is scheduled for maintenance on Saturday, September 22nd and Saturday, October 6th beginning at 10:00 pm. You may experience issues accessing Poll Everywhere during these times. If you have any questions, feel free to contact the UW-W Learning Technology Center.